Lisbon. Spilled over the silver Tagus River, it is known by its beautiful low light, incredible food and friendly people. Here, cultures met, and poets dreamed, as navigators gathered to plan their journeys to old and new worlds. 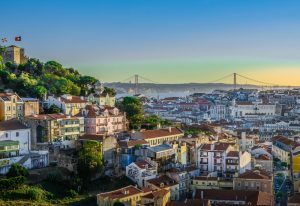 Fustigated by one of the greatest disasters the world has ever witnessed, Lisbon is intertwined with the course of Earth Sciences. For some, modern seismology was born here. For others, this might even have been the place where it all begun; what we now call geology. 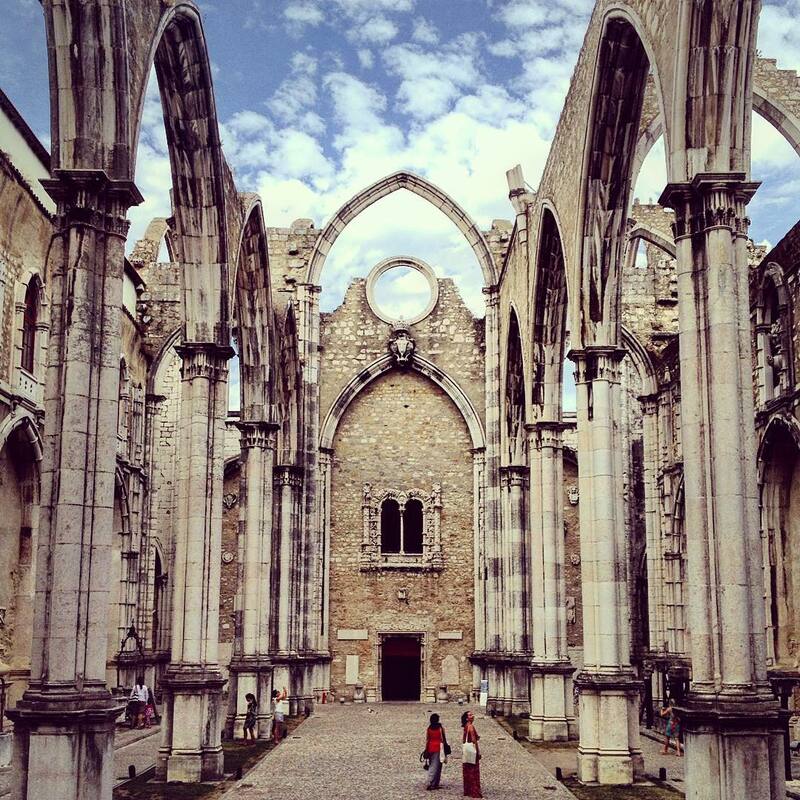 On the morning of All Saints day of 1755, a giant earthquake struck the city of Lisbon. With a magnitude of ~8.7, the event was so powerful that it was felt simultaneously in Germany, as well as in the islands of Cape Verde. The main shock occurred around 9.40 am, when a significant portion of the population was attending the mass in churches. Lasting several minutes, many of the roofs collapsed and thousands of candles set fires that would last for days. While people were looking for safety at open areas near the river, three giant tsunami waves were on their way. Forty minutes after the main shock, the waves rose the Tagus River and flood the city’s downtown. The death toll in Lisbon reached up to 50,000 people, about one quarter of Lisbon’s population at the time. This event is known as the Great Lisbon Earthquake of 1755. Painting depicting the day of the 1755 Great Lisbon Earthquake. Credit: Wikipedia. 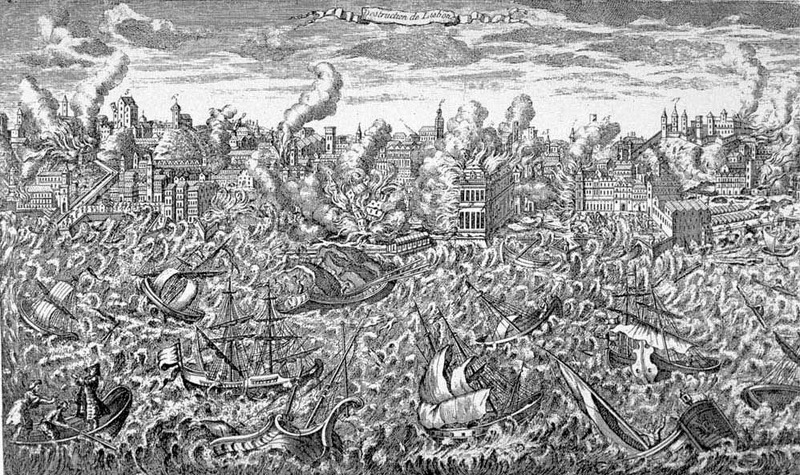 The 1755 Lisbon Earthquake was a terrific natural disaster. A few years ago, the French magazine L´Histoire, considered this earthquake as one of the 10 crucial events that changed history. At the time, Lisbon was a maritime power in a maritime epoch. This was also the age of Enlightenment, when man started to realize that many events such as earthquakes, volcanoes and storms, had natural causes, and were not sent by gods. Convento do Carmo, destroyed during the 1755 earthquake and kept as a ruin for memory. Credit: Flickr. The minister of the King of Portugal at the time, the Marquis of Pombal, sent an enquiry to all parishes in the country with several questions. While some of the questions were intended to evaluate the extent of the damage, it is now clear that the Marquis was also trying to gain (scientific) knowledge about the event (see Duarte et al., 2016 and references therein). For example, he asks if the ground movement was stronger in one direction than in other, or if the tide rose or fell just before the tsunami waves arrived. Today, we can reconstruct with rigor what happened that day because of the incredible vision of this man. The center of Lisbon today. The statue of Marquis of Pombal facing the reconstructed downtown. Credit: Wikipedia. Coming back to Lisbon. If you visit the old city by foot, you will realize that houses on the hills are closely packed, separated by narrow streets and passages, while in the flat downtown streets are wide and orthogonal. The hilly parts of Lisbon are an heritage of the Moorish and Medieval times. Mouraria and Alfama are the ideal neighborhoods to visit. 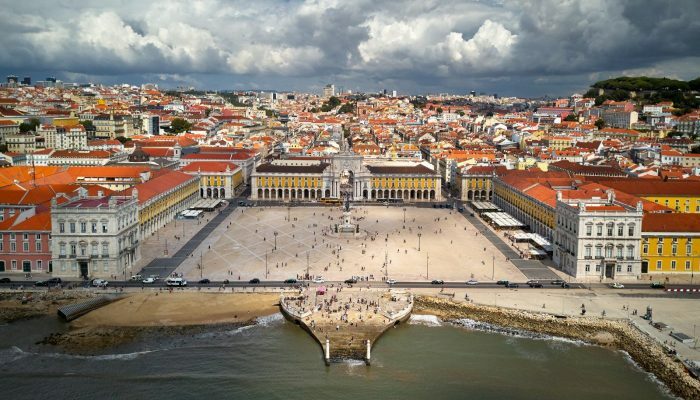 The organized downtown was the area that was totally floored during the earthquake, due to ground liquefaction and the impact of the tsunami, and was rebuilt using a modern architecture (see Terreiro do Paço and the downtown area in the first figure in the top). The Grand Liberty Avenue is clearly inspired by the style of the Champs-Élysées. Going up the Liberty Avenue, from the downtown, you will find the statue of the Marquis of Pombal (see figure above). And if you are already planning to visit (or revisit) Lisbon, you should definitely stop by the Carmo Archeological Museum, a ruin left to remind us all of what happened on that day of 1755, and the Lisbon Story Centre. The hills of Lisbon, with the Castle in the top left and the 25 de Abril bridge in the background. Credit: Flickr. 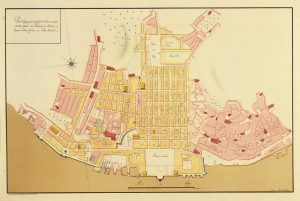 Rebuilding plan after the 1755 earthquake. Credit: Wikimedia Commons. The 1755 Great Lisbon Earthquake was however not the only earthquake that hit the city. On the 28th of February 1969, another major quake, with a magnitude of 7.9, struck 200 km off the cost of Portugal, at 2 am in the morning. The earthquake generated a small tsunami but luckily, given the late hours, did not caused any casualties. This event also occurred in a particular point in history: The time of plate tectonics. The paper that inaugurated plate tectonics had been published only 4 years before, by Tuzo Wilson. And in 1969, geoscientists already realized that some continental margins were passive and did not generate major earthquakes, such as the margins of the Atlantic, while others were active and fustigated by major earthquakes, such as the margin of the Pacific (Dewey, 1969). It was somewhat strange that this Atlantic region was producing such big earthquakes, which therefore immediately resulted in scientists coming to study this area (see map below). Fukao (1973), studied the focal mechanism of the 1969 earthquake and concluded that it was a thrust event. Purdy (1975), suggested that this could result from a transient consumption of the lithosphere, and Mckenzie (1977) proposed that a new subduction zone was initiating here, along the east-west Africa-Eurasia plate boundary (see the thinner segment of the dashed white line in the eastern termination of the Africa-Eurasia plate boundary, map below), SW of Iberia. 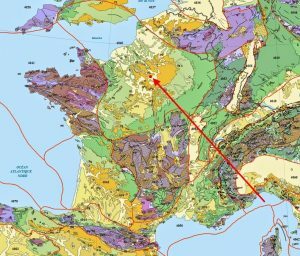 Later on, in 1986, António Ribeiro, professor at the University of Lisbon, suggested that instead, a new north-south subduction zone was forming along the west margin of Portugal (yellow lines in the map), a passive margin transforming into an active margin. This could explain the high magnitude seismicity, such as the Great Lisbon Earthquake of 1755. Map showing the main tectonic features in the SW Iberia margin. The Eurasia-Africa plate boundary spans from the Azores-Tripe Junction (on the left) until the Gibraltar Arc (on the right, with its accretionary wedge marked in grey). The yellow lines mark a new thrust front that is forming and migrating northwards away from the plate boundary and along the west Iberia margin. The smaller yellow line marks the approximate location of the 1969 earthquake. The 1755 Great Lisbon Earthquake might also have been generated in this region (see Duarte et al., 2013 for further reading on the tectonic setting of the region; the figure is adapted from this paper). Today, we know that the SW Iberia margin is indeed being reactivated (Duarte et al., 2013). Whether this will lead to the nucleation of a new subduction zone is still a matter of debate, and we will probably never know for sure. 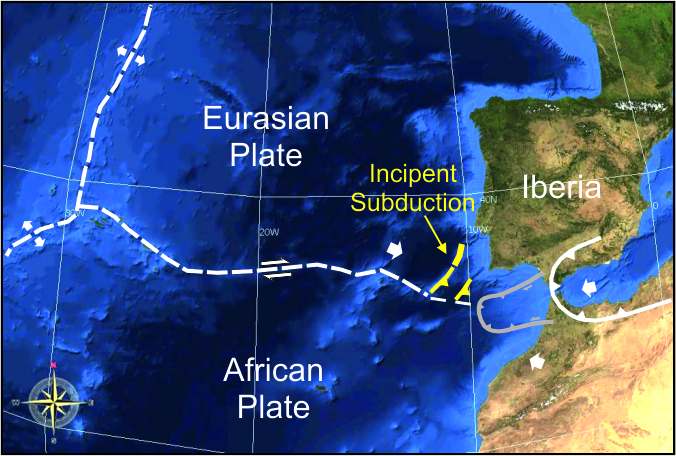 Nevertheless, subduction initiation is one of the major unsolved problems in Earth Sciences, and the coasts off Lisbon might constitute a perfect natural laboratory to investigate this problem. It may be the only case where an Atlantic-type margin (actually located in the Atlantic) is just being reactivated, which is a fundamental step in the tectonic conceptual model that we know as the Wilson Cycle (see also Duarte et al., 2018 and this GeoTalk blog). In any case, we know that there are two other locations where subduction zones have developed in the Atlantic: in the Scotia Arc and in the Lesser Antilles Arc. How they originated is still being investigated; which is precisely what we are doing now in Lisbon. That is however a topic that deserves its own blog post. Researcher at Instituto Dom Luiz and Invited Professor at the Geology Department, Faculty of Sciences of the University of Lisbon. Adjunct Researcher at Monash University. For more information about the Great Lisbon Earthquake of 1755, check out these two video’s about the event: a reconstruction of the earthquake and a tsunami model animation. Dewey, J.F., 1969. Continental margin: A model for conversion of Atlantic type to Andean type. Earth and Planetary Science Letters 6, 189-197. Fukao, Y., 1973. Thrust faulting at a lithospheric plate boundary: The Portugal earthquake of 1969. Earth and Planetary Science Letters 18, 205–216. doi:10.1016/0012-821X(73)90058-7. Kant, I., 1756a. On the causes of earthquakes on the occasion of the calamity that befell the western countries of Europe towards the end of last year. In, I. Kant, 2012. Natural Science (Cambridge Edition of the Works of Immanuel Kant Translated). Edited by David Eric Watkins. (Cambridge: Cambridge University Press, 2012). Kant, I., 1756b. History and natural description of the most noteworthy occurrences of the earthquake that struck a large part of the Earth at the end of the year 1755. In, I. Kant, 2012. Natural Science (Cambridge Edition of the Works of Immanuel Kant Translated). Edited by David Eric Watkins. (Cambridge: Cambridge University Press, 2012). McKenzie, D.P., 1977. The initiation of trenches: A finite amplitude instability, in Talwani, M., and Pitman W.C., III, eds., Island Arcs, Deep Sea Trenches and Back-Arc Basins. Maurice Ewing Series, American Geophysical Union 1, 57–61. Purdy, G.M., 1975. The eastern end of the Azores–Gibraltar plate boundary. Geophysical Journal of the Royal Astronomical Society 43, 973–1000. doi:10.1111/j.1365-246X.1975.tb06206.x. Ribeiro, A.R. and Cabral, J., 1986. The neotectonic regime of the west Iberia continental margin: transition from passive to active? Maleo 2, p38. Paris, 2000 ya. Claude is sweating all over. It’s mid-July and the sun is burning on his skin. With his hammer and shovel he is digging up grey and white stones. The faults and fractures in the rock help him to get the rocks out easily. But still, it’s hot and humid and his shift isn’t over yet. Luckily he can’t complain about the view. Lutetia, one of the new Roman settlements lies right in front of him, on the left bank of the Seine river. Paris, 700 ya. Pierre sighs out deeply, his back hurts, but he has to continue. In the small corridors of the underground quarries at Montrouge south of Paris, he is digging for gypsum and cutting limestone for building material. The quarries are narrow and low, so he has to bend over all the time. Mining gypsum is easier, it’s a softer material. It’s the limestone that makes him suffer. Paris, 300 ya. Jean covers his mouth. The stench is unbearable! Over 12 generations of Parisians are buried at the cemetery ‘Les Innocents’ in the heart of Paris. Last week, the cellar of a house located below the cemetery collapsed under the weight of the buried. The king decided to close all cemeteries within the city centre and so the cemeteries are being emptied. Jean found a job in this chaos, pulling a wagon at night, from the cemetery to entrance of the old, abandoned quarries south of the city. Paris is located at the heart of the Paris Basin, a NW-SE trending oval feature that measures over 140.000 km2 and extends into the United Kingdom (Figure 1). The basin is positioned on top of a Palaeozoic crystalline basement. The lower lithologies are marine and continental sediments of Permian and Mesozoic age. A major subaerial, Palaeocene erosion event was followed by the deposition of Eocene limestones that is known now as ‘Parisian limestone’. 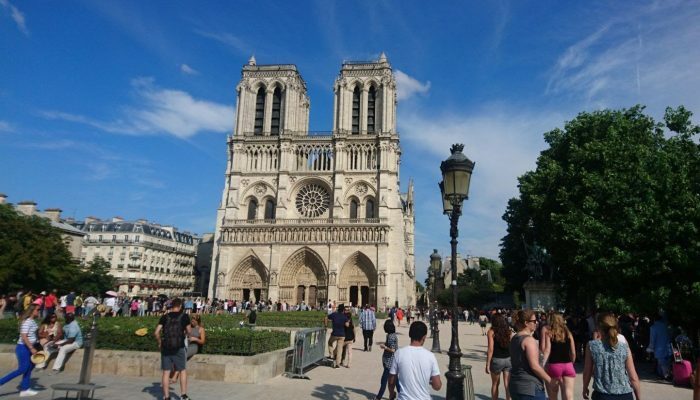 The beige-white rocks are among the most famous building materials that is nowadays exported all over the world, but they used to be the main building material that characterizes the city of Paris. Of course, it is no coincidence that these rocks are of ‘Lutetian’ age, as Lutetia was the Latin name for Paris. The Lutetian is followed by the Bartonian stage, in which gypsum was deposited in the Paris basin, the second most important material that was mined in the Paris region. Oligocene, Miocene and Neogene successions consist of sands, marls and clays and cover all older sediments. The familiar light-coloured, 6-7 stories high buildings, decorated with balconies and ornaments are Paris’ most famous selling point. Throughout the 20 districts all kinds of structures can be found that are made from these rocks; from regular houses to famous sights, such as the Notre Dame and the Louvre Museum. The rocks do not come from far. Scattered through the city, old quarries can be found above and below the ground (Figure 2). They were intensively mined from 2000 years ago until the 17th century to provide building material for the city of Paris. Figure 2. 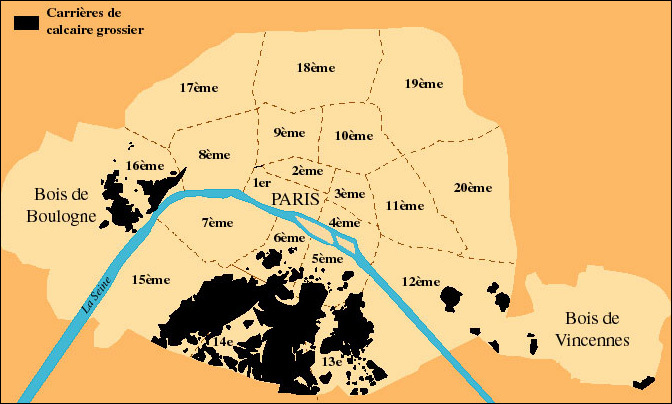 Map of Paris with in black the old limestone quarries. Gypsum was mined around Mont Montmartre (18th arrondissement) and Belleville (19th and 20th arrondissement). Credit: Papyserge blog. The very first mining activities in Paris were in an ‘open-pit’ kind of fashion, as our friend Claude from the introduction experienced. Paris was relatively small and these quarries were located just outside the old city walls. 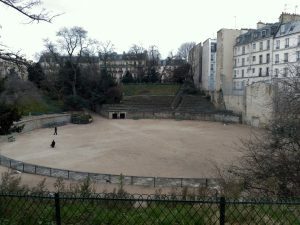 From some of them, we can still see signs nowadays, like the ‘Arènes de Lutèce’, situated in the 5th arrondissement. This was an open-pit mine that later turned into a small Roman amphitheatre (Figure 3). Figure 3. ‘Les Arènes de Lutèce’. Before this place turned into an amphitheatre for the amusement of the Roman people it served as a limestone quarry to provide building material. Credit: Anouk Beniest. As Paris expanded, more building material was needed. Even though the already excavated blocks were re-used, underground quarries for limestone and gypsum emerged below Montrouge (14th district), Parc Montsouris (13th district), Parc Butte-Chaument (19th district) and Montmartre (18th district). People like Pierre were subsurface miners. Initially they only excavated the Lutetian limestones. Later also Bartonian gypsum was extracted. Eventually the quarries moved south of Paris, outside the present-day city-limits, leaving a whole network of galleries and corridors below the city (Figure 4). These quarries below Paris were almost forgotten, as they were abandoned for several decades. When the largest cemetery in the city-center of Paris, ‘Les Innocents’, collapsed and conditions became untenable, the king decided to clear all cemeteries within the citywalls. Our friend Jean was paid for his duties, moving carriages full of bones to the southern end of the quarries, close to the present-day entrance of the catacombs at ‘Denfert-Rochereau’. The major clean-up took a year-and a half during the end of the 18th century and resulted in corridors full of nicely stacked bones, decorated with skulls (Figure 5). During a second wave, more cemeteries were emptied in the early 19th century. Even after World War II, the old quarries at Pièrre-Lachaise were used as final resting place of the thousands of Parisians that found death during the war. Figure 4 (left). One of the restored quarries below Paris. The pillars were used to support the overlying rocks and to avoid collapsing of the galleries. Credit: Secret de Paris. Figure 5 (right). 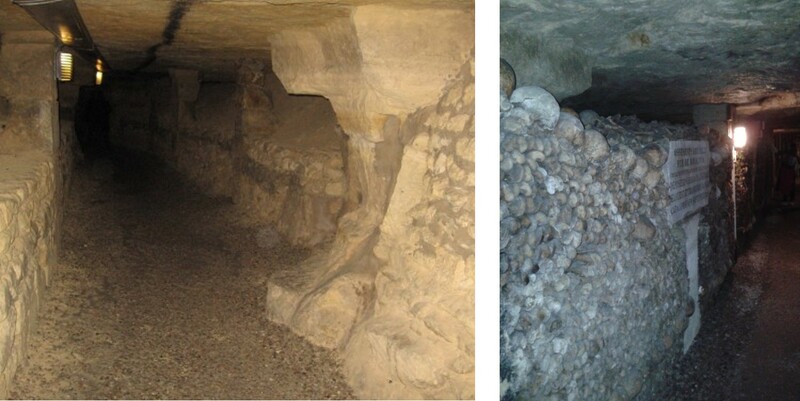 The galleries of the old quarries were filled with the buried from the Parisian cemeteries. The remains were neatly stacked into blocks with the skulls used as decoration. Marble sign were placed to remind visitors of the origin of the bones. Credit: Anouk Beniest. For over 150 years, parts of the catacombs have been accessible so people could pay tribute to their dead ancestors. During periods of civil unrest, people would use the old quarries as hide-outs. This was of course not without any risk; people could easily get lost and never see daylight again. In calmer periods, people would still search for ways to get inside, to party all night, go on adventure or just enjoy the silence without leaving the city. In 2005, part of the catacombs was renovated and 1.7 km of galleries is now open for public. The other 300 km of abandoned quarries remains closed, and only those who know the secret entrances dare to descend into these ancient galleries, where Pierre used to mine his limestones and Jean dumped his load of bones. Walking through an ancient and fascinating city like Rome, there are signs of history everywhere. The whole city forms an open-air museum, full of remnants of many different times the city has known, from the Imperial to the Medieval times, the Renaissance, the Fascist period, and finally the present day version of Rome. For historians and archaeologists, unravelling the exact history of the city proves to be a major challenge, since things are only partly preserved or have been renovated or moved to serve a different purpose. This might sound familiar to geologists, since they deal with the same type of problems, just on much larger scales, both spatially and temporally. Although you might expect to find the keys to the geological history of Rome and its surroundings outside the city, there’s actually a great deal of hints within the city itself. Let’s start with the roads you would walk on, during a visit to Rome. 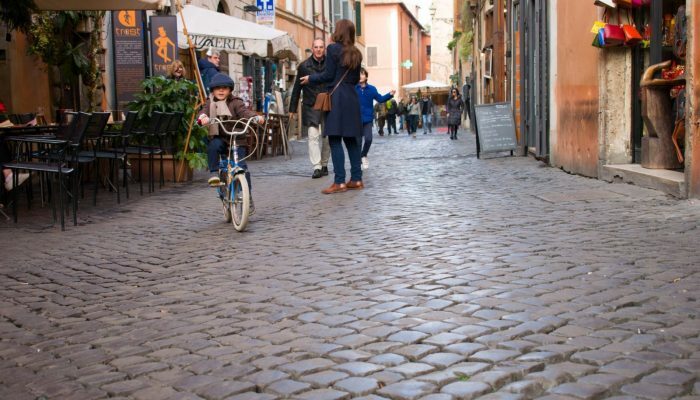 If you’ve ever been to Rome, you might remember the black cobblestones, which form the pavement for many streets in the historical centre of Rome. The Italians call them ‘sanpietrini’, cubic-shaped blocks made from volcanic rocks coming from the surrounding volcanic regions. Two of these volcanic regions are the Alban Hills, southeast of Rome, and the Sabatini volcanic complex, northwest of Rome. They are part of a line of volcanic fields along the edge of the Italian peninsula, stretching from Naples, all the way to Tuscany. Eruptions in these areas were mainly explosive and created large volcanic plateaus and craters. One of those plateaus was formed by an eruption of the Alban Hills volcanic field and consists of volcanic tuff stone. Over time, erosion has altered this plateau and created a topography of valleys and hills, including the seven hills that Rome was built on. These hills are still remarkable features in the city today, for example when you climb the stairs to the Capitoline Hill and have a gorgeous view of the Imperial Forum or when standing on the Aventine hill in the south, looking down on Circus Maximus in the valley below you, and seeing the ruins of the imperial palaces on the Palatine hill in front of you. Left: Map showing the regional relief and the two volcanic complexes north and south of Rome. Credit: modified from Funiciello et al., 2003 by Francesca Cifelli. Right: The seven hills of Rome. Credit: theculturetrip.com. The volcanic rocks in the Roman area did not only shape the landscape, they also served (and still do!) as an important water supply to the city. Springs in the areas, but also freshwater lakes formed in the volcanic craters are important sources for the city’s water budget. In fact, last summer Rome was in a state of panic, since severe drought and extremely hot temperatures had a big impact on the water level of volcanic lakes providing water to Rome and city officials were considering rationing drinking water for the Roman citizens. Another important water supply to Rome are the springs in the Apennines, a NW-SE trending mountain chain, also called ‘the backbone of the Italian peninsula’. This mountain chain is the result of a collision between the African and Eurasian plates, which was part of a series of complex collisions and extensions of the Earth’s crust in the Mediterranean region, lasting from roughly 100 million years to 2 million years ago. During the last 20 million years, the Italian Peninsula rotated counter-clockwise, resulting in the formation of what we now call the Tyrrhenian sea. This period of extension also formed the onset of volcanic activity in the region. 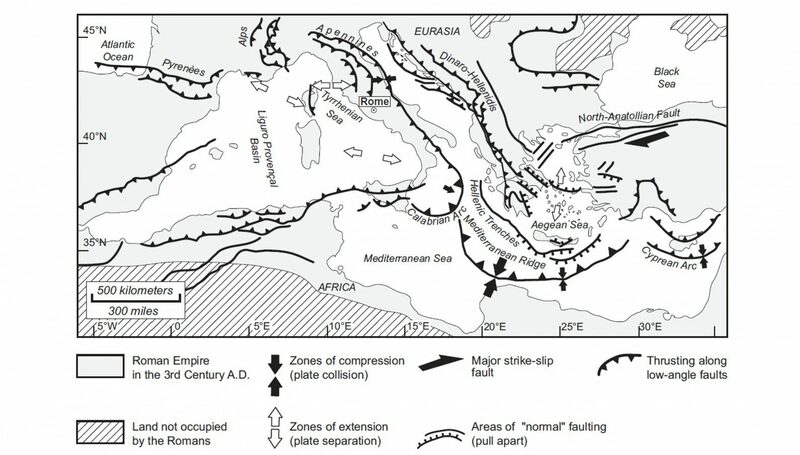 Map of the Mediterranean highlighting the main tectonic processes. Credit: Introduction to the Geology of Rome. The rocks in the Apennine mountain range are limestone, deposited in ancient shallow seas as long as 300 million years ago. These rocks became very important to Rome, since they formed major rock reservoirs, which have been used for water supply for many centuries. Many remains of ancient aqueducts carrying water to Rome can still be found nowadays, and some of them are still being used, like the Vergine aqueduct, bringing water to the Trevi fountain. Also the ‘fontanelle,’ little fountains on the streets everywhere in Rome, are part of this water supply system and always provide clear, cool, and drinkable water. And if you’ve ever spend a day in Rome during summer, you know how valuable these fontanelle are! The limestone that ended up in the Apennines often were converted into marble due to the high pressures and temperatures during collision. This marble can be found everywhere in Rome, since they have been used as building blocks for various structures like the Pantheon and Trajan’s column. Another rock which has been used a lot for Roman buildings is travertine, which forms by the evaporation of river and spring waters. Many temples, aqueducts, amphitheatres, and monuments have been built with travertine, but the most famous one is the Colosseum, which is the largest building in the world constructed mainly of travertine blocks. Have you ever wondered why part of the outer ring of the Colosseum is missing? It is actually also linked to geology, since the southern part of the Colosseum collapsed during a historical earthquake. The tectonic processes which formed the Apennines still produce irregular movement along all kinds of faults on the Italian Peninsula, generating frequent earthquakes. The reason why only the southern half of the Colosseum collapsed (fortunately!) is because it had been partly built on unconsolidated alluvial deposits. When shaken by an earthquake, these loose sediments amplified the shaking and therefore caused severe damage to the southern part of the amphitheatre. The site effect: amplification of seismic waves due to the properties of the subsurface. Credit: Ciaccio and Cultrera (2014) Terremoto e rischio sismico. These type of alluvial deposits can also be found at the floodplains of the Tiber, the river which passes through Rome and played an important role in the city’s development. Romans in the imperial times did not build any houses on the floodplains of the Tiber, because they knew the river would flood every once in a while. Instead, they built theatres, temples, and army training facilities which could easily be restored and would not harm the societies too much. Another reason not to build along these floodplains is the same reason which damaged the Colosseum: the increased risk of earthquake damage due to amplification of the shaking. Unfortunately, nowadays, many areas close to the river are covered with residential areas and even though the risk of flooding has decreased due to the 12 meter high walls surrounding the Tiber today, the risk of increased earthquake damage still exists. And now I think of it, I am living in one of those areas myself, in Testaccio, a neighbourhood just south of the Aventine hill. I guess this amplification of the shaking due to the alluvial deposits below my feet is the reason why I feel a slight shaking (even when living on the fourth floor!) every time a large truck passes by. Roughly 2000 years ago, Testaccio was not a residential area, but was used as the location for an olive oil warehouse along the Tiber. We even have an ancient garbage dump in our neighbourhood, which is now part of the local landscape and is referred to as ‘Monte Testaccio,’ literally meaning ‘Testaccio mountain’. Romans would pile up discarded amphorae, which were used to store the olive oil, leaving a hill composed of fragments of roughly 53 million amphorae. Left: the Tiber river bounded by its 12 meter high walls, which should prevent the city from future floods. Credit: Elenora van Rijsingen. Right: millions of amphorae fragments piled up in an organized way and together forming the Monte Testaccio. Credit: Flickr. Clearly, in Rome not only geological processes shaped the landscape, but also deposits called human debris played a role. Digging an imaginary hole below your feet anywhere in Rome might reveal more ancient houses, businesses, or roads, all buried during the continuous evolution of the Eternal City. And that’s one of the reasons why, for example, the work on the new metro line here in Rome is taking so long! Every ten meters, they stumble upon a new archaeological site, all revealing new hints about what the city was like hundreds to thousands of years ago.